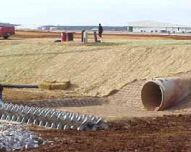 Prior to the deployment of troops in the Iraqi war effort, a new tarmac airport runway apron for the airstrip nearest Gate 7 was constructed at Fort Campbell in Clarksville, Tennessee. The new tarmac - measuring 2,800-ft. long by 500-ft. wide - replaced an earlier version that featured five separate turnaround aprons. In order to correct the groundwater runoff caused by the new solid tarmac, a 72-in. concrete outfall was installed to collect the flow of water accumulation. The U.S. Army Corps of Engineers selected 24-in. A-Jacks and ArmorFlex Class 50S articulating concrete block (ACB) mats and hand-placed units. The 1,036 sf of ACB mats were installed and abutted two rows of A-Jacks, effectively dissipating the water velocity and controlling the flow prior to its release into the basin. This eliminated massive erosion to the ground surface. The entire project took only two days to complete including site preparation. Four laborers and one piece of heavy equipment were used. Due to the extreme security surrounding the project, the contractor worked without the benefit of a Contech representative and was still extremely pleased with the outcome of the installation.